The new Backpack Valve Actuator can help companies produce more products in less time by making it possible to cycle select Nordson EFD valves 2 – 3 times faster than previously possible. The faster valve actuation also makes it possible to produce the smaller fluid deposits required in the assembly of many of today’s advanced products, such as medical devices and portable electronics. 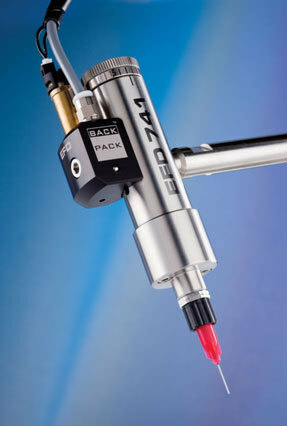 Incorporating advanced miniature solenoid technology, the innovative BackPack mounts the solenoid used to open and close the valve directly on the valve’s air cylinder, rather than on a separate fixture. This makes it possible to achieve valve actuation speeds as short as 5 - 6 milliseconds and cycle rates as high as 800 per minute. In contrast, typical valve actuation speeds and cycle rates are 15 milliseconds and 400 cycles.